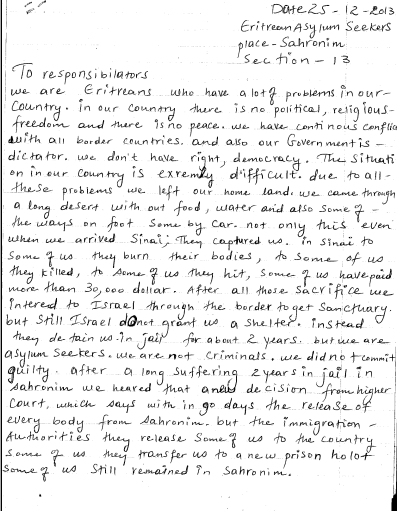 Below is an edited version of a letter sent to the Hotline for Refugees and Migrants by five Eritrean asylum-seekers detained in Holot detention camp. This is the first post in a series of posts that will bring the voices of the asylum-seekers detained in Israel, far away from the public eye. We are Eritrean who have a lot of problems in our country. In our country there is no political or religious freedom, and there is no peace. We have continuous conflict with all our border countries. Our government is a dictatorship. We don’t have rights or democracy. The situation in our country is extremely difficult. Due to all these problems we left our homeland. We came through a long desert without food and water. Some of the way we walked on foot, some by car. When we arrived in Sinai, they captured us. In Sinai, they burn the bodies of some, they kill others, some of us are hit, some of us have paid more than 30,000 dollar [to be released from captivity]. After all those sacrifices we entered Israel through the border to get sanctuary. But despite all this, Israel does not grant us shelter. Instead, they detain us in jail for about two years. But we are asylum-seekers. We are not criminals. We are not guilty of any crime. After a long suffering of 2 years in jail in Sahronim we heard that a new decision from higher court, which says that in 90 days, everybody will be released from Sahronim. But immigration authorities released some of us to the country, but the rest were transfer to a new prison, Holot. Some of us still remained in Sahronim. Holot is the same as Sahronim. Only the name changed but if you see the situation in Holot you will realize it’s a prison – we need to sign three times in a day. The administrators in Holot [Israeli Prisoner Services] said, if you want to go outside ask for permission, but if you ask them they don’t allow you to. Holot is not a place where we can have a free life. We are living from jail to jail. Because of all these difficulties we went to Jerusalem to announce to the people of Israel that we are refugees and call on all humanitarian organizations to stand beside us. But when we reached Jerusalem, before we completed our demonstration, the immigration authorities used force to stop the peaceful protest. One person fainted and one was seriously injured by the immigration. Those who protested in Jerusalem were brought back to the old prison, Sahronim, and some to Holot, the new prison. Because we did not get a reply for the protest we did in Jerusalem, we started another protest march from Holot and started walking to Beer Sheva. We completed all the rules of Holot – we signed in the morning and afternoon, but immigration workers stopped us from marching very early. We were stopped with force half way to Beer Sheva. In our conclusion we want to remind the government of Israel that we are not criminals, we are refugees. We also want to remind the government of Israel that those who used force against us during the peaceful protest need to be put on trial. They also need to compensate the victims during the protest and all the time we lost in jail for about 2 years. If Israel is unable to grant us asylum, we are politely requesting the government of Israel to transfer us to third country that will grant us asylum. God bless the people of God, the people of Israel!